Elbert Wilhelm, of Piqua, drives an antique tractor in the Grand Parade Saturday at Versailles Poultry Days just moments before he loses control and goes into the crowd, injuring four spectators. VERSAILLES — The driver of the tractor that injured four spectators at a parade Saturday will be cited for a traffic violation, Versailles Police Chief Mark Humphreys said Monday. 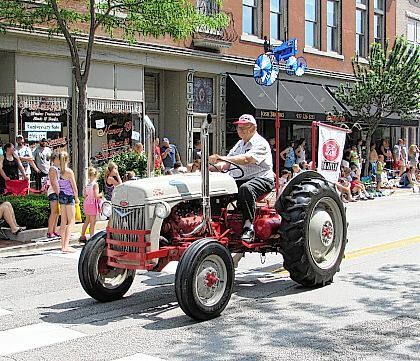 Wilhelm was participating in the Grand Parade Saturday at Versailles Poultry Days when he lost control of the antique Ford tractor he was driving, and it went into the crowd. Humphreys said another paradegoer sustained minor injuries in the incident, but she refused treatment at the scene.